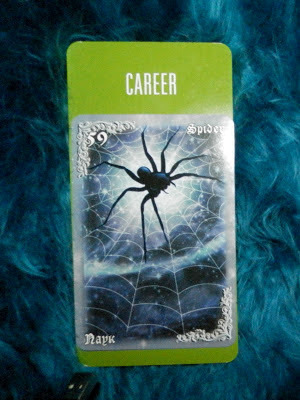 Today's Draw: Spider from the Breath of Night oracle in the Career position from the Deck of 1000 Spreads. Are you fairly young in your career? Are you thinking of becoming a consultant? Do you ever wonder why your networks don't work for you? This combo immediately made me think of two things, career-wise. One is the whole idea of networking. I know some people, and I'm sure you do too, who are all about networking. They hang out with other people who network. They talk a lot about the people in their network. And they judge your value based on who you know and how valuable a member of the network you'll be. These people usually snub me...haha. I don't have the right look. I don't lead with my strengths. And because I really don't network, they don't see me as someone who can help them out. The ironic thing is that, in some cases, these are people who I *can* help out. But I never will. Because I would never subject one of my contacts to them. They're too sharky for anyone I know. And to be fair, they wouldn't refer me, either. I don't come off as smart or as capable as I actually am. All of this leads to the second thing I'm going to talk about, which is referrals. The people who know me know what I'm capable of. So they refer me. I get all my business from referrals. And while others struggle with their consulting, I'm fairly consistently engaged. I mean, business goes up and down for everyone, but I'm talking over the course of 17 years...the clients I have today are either the same clients I started with (and many of them are) or they were referred to me by those clients. But there's another aspect to this which is a valuable nugget to anyone looking for work—reach out to the people you think hate you. Really. There have been a number of times that someone I thought hated me referred me to someone and it was good work. I always tell this to people just starting out. Let everyone you've ever worked with know you're available. There are numerous points of logic behind this. One is that everyone, even the people who hate you, like to be the one "in the know". So if someone is looking for a staff accountant, your non-friend may volunteer you as someone who is available, maybe not to come work in her company, but to go somewhere else. It makes her look like a hero. Another point of logic behind this is that many of us understand our dislike for someone is separate from how competent they are. Your non-friend may hate the way you whistle through your teeth, but she's always been able to trust your numbers. Another point of logic is that you may THINK this person hates you, but chances are they just really don't think about you at all. I recently got a pretty awesome referral from someone I think just really doesn't "get" me. But she knows the people I work with in her company respect me, and someone was looking, so what the heck? She referred me. She'd probably never hire me herself, but I'm good enough for her friend...haha. On the other side of that stick, there is a man from a place I used to consult at and he was very vocal about his dislike of me. Years go by and I come across him again in a different context. And now he's OK with me and wants to hire me for some work. So it's wise to remain open even to people who hate you...haha. These networks take some time and care to build. The minute you start making connections for "greedy" reasons, it will be felt and you'll be in that category that turns people off. Connections are best made by being competent or learning from your mistakes or persevering. People respect those things and can generally separate them from lesser character flaws. Connections are also best made by avoiding the larger character flaws, like gossip, tattle telling, complaining and an overall bad attitude. Even if you're in a big company, people's eyes are always on you. Someone may not know your name, but they know "people seem to like that woman" or "she seems to know what she's doing." You'd be surprised at who sees you around. And this extends to people who aren't even in your profession—people you know socially. What it all comes down to is whether you're a consultant or employed, it behooves you to remain neutral as much as possible. Keep your head in your work, don't hang out with the gossipers, show respect to everyone you come across (even if they don't return the favor) and, instead of focusing on being everyone's friend, focus on having redeemable qualities. It's really about being a good, fair, capable person in every aspect of your life. Work too hard at being likable or referrable and people will smell it. Just be a decent person. It's not so hard. Don't try. There's no need to. It will happen naturally. And if you're currently looking for work, touch base with all the people you know and let them know you're available. Just that. Don't bug them. Same thing if you're changing careers. Things like Linked In and Facebook are great for staying in front of people...not with your desperate pleas for work, but just to remind them you exist by posting updates like "what a beautiful day!" Never complain about work or clients on Facebook. I've gotten work off Facebook from existing contacts, but Linked In seems to work for me *after* some new contact has found me through their networks. People go there to look at your resume and stuff. And as with everything, refer people when you can to keep that flow going. Because I work on a referral basis, I see more of it than someone who isn't a consultant normally would. And I'm constantly amazed at where help does and doesn't come from (some people may actually hesitate to refer you because they don't want you getting so much work you're no longer serving them well). The best advice is not to TRY. Just be competent and have some sort of other redeeming quality. And you'll do fine.